Stockbridge, MA, July 5, 2018 – Norman Rockwell Museum will honor the heroism and sacrifice of those who served in World War I, on Saturday, July 14 from 1 to 4 p.m. This special event will explore the experiences of those affected by the war through poetry, performance, and Rockwell’s art. World War I took place from July 28, 1914 to November 11, 1918. This year marks the 100th anniversary of the end of the war. Centennial programs occurring around the country work to educate the public about the causes and courses of the war, and commemorate the role of Americans in this global event. Featured speakers include Rob Doane, U.S. Naval College Curator, who will explore the war’s historical underpinnings, and Tom Daly, Norman Rockwell Museum Curator of Education, who will discuss Rockwell’s experiences of World War I, connecting his art with history. Actors from the Berkshire region will read two scenes from, Either Side of Zero, a work-in-progress pay by R.B. Breese. This new play looks at poetry and family through World War I poets Joyce Kilmer and Rupert Brooke, who both died in battle. 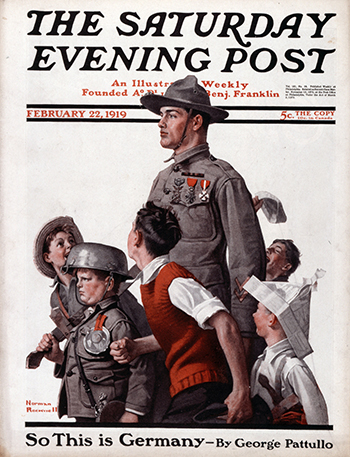 Norman Rockwell lived and worked through both World Wars. Many of Rockwell’s Saturday Evening Post covers feature participants of the war and reflect on the lives of citizens during this period. Although many of his paintings addressed serious issues, Rockwell’s work also presented Americans with visions of a more idyllic world through his sense of natural playfulness. The event is free for Museum members, or included with Museum admission. Veterans receive discounted admission.